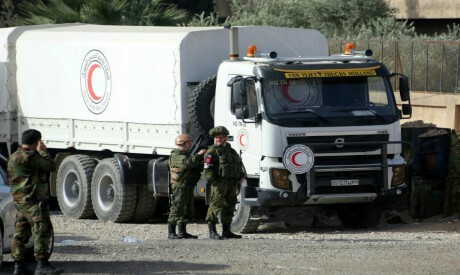 "The convoy for today is postponed, as the situation is evolving on the ground, which doesn't allow us to carry out the operation in such conditions," ICRC spokeswoman Ingy Sedky told AFP. Ghouta is home to around 400,000 people under siege and is the last opposition-controlled zone on the capital's outskirts. AFP's correspondent in the town of Hammuriyeh saw motionless bodies lying in the streets on Thursday after a night of ferocious bombing. On Wednesday, volunteers from the civil defence group known as the "White Helmets" were seen trying to douse flames burning two men lying dead on the street next to a motorbike after a strike. "I'm going to suffocate," two children screamed as rescue workers carried them down from the roof for treatment. The UN's humanitarian coordination office (OCHA) in Damascus told AFP the convoy could not go through Thursday because it had not received permission from Syrian authorities. "Today, the UN and partners were not able to return to Douma in east Ghouta because the movement of the convoy was not authorised by the Syrian authorities due to security reasons," said spokeswoman Linda Tom. The UN's top body met behind closed doors on Wednesday for three hours in an attempt to shore up the ceasefire.